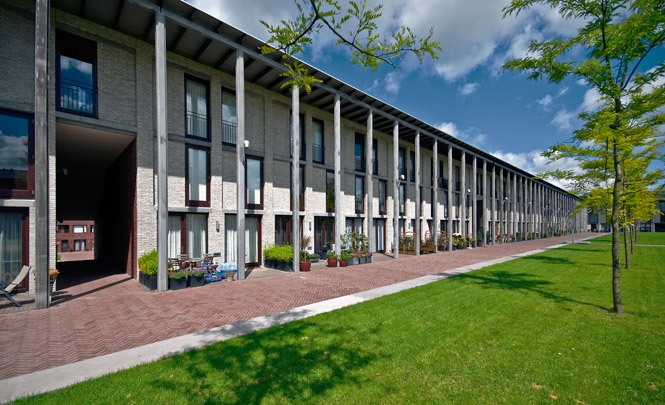 In De Venen, a sub-area of Ypenburg, the housing takes its cue from the traditional 'hofje' or residential courtyard. In this case Rapp+Rapp opt for the large arcaded cloisters of monasteries rather than the smaller hofjes found in towns. The ensemble ranges four square courtyards with pitched roofs round a higher-lying oblong court with lean-to roofs above a parking facility. Roughly clover-leafed in plan, the whole is surrounded by water features and registers as something of an island in the district. The back gardens lie along the water. Stairs connect the central court to the four shared courtyards from which all dwellings are accessed. Building-high concrete columns in the central, most public court create a private zone for the dwellings.